Count Me In contains more than 300 of the most successful ice-breakers, energisers, interactive games and team events for LARGE groups (or indeed any size group) that I know and use. This one is for my folio. 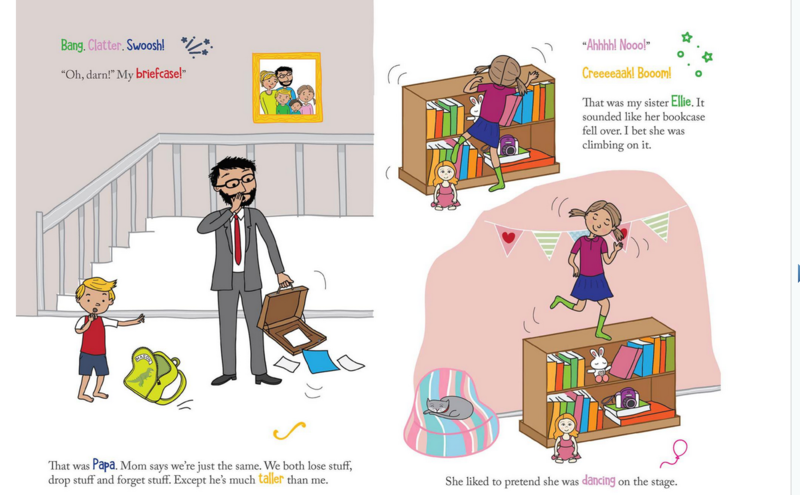 The Magic of Miss Poly Loly is now available for your kindle or as a hard copy. There will be 2 more stories to follow. I had fun illustrating these! The reason I haven’t been able to post lately is because I have been really busy with the illustrations for 4 books. Just getting ready to send off the final pages later today. So now I can make some new bluwren products. I was pleased to see the Mitcham Monsters I created in a video for the Education Department. This is about Kung fu Punctuation. If you look carefully in the background you will see the monsters. Follow the above link to see the program. Great teachers, great students and great program, well worth a watch. At the beginning of third term, I was working with some international students from China, who were at school for a short short time. They were here to improve their English and to experience life in an Australian School. I created a set of animals who were beginning to learn to speak English to use to teach greetings and useful phrases. Hope to find this soon and complete them and add them to the shop. Just need to get the translation checked, as they have the characters included. If you’re in need of some activities to help your EAL/ESL students, check out my four top selling products. I am so pleased that they have been received well by the buyers. Families are made up of many different people who have different titles. This is a useful teaching resource when students are learning to name family members (mother, father, sister, brother, grandmother, grandfather, uncle, aunty, cousin, niece, nephew, son, daughter, etc.). On the cards I have also included the pronouns relevant to that family member. There are 32 different actions verbs illustrated in a fun way. Play charades or other games and teach past and future tenses with these cards. Verbs illustrated in this pack include: sitting, standing, skipping, jumping, leaping, running, climbing, walking, spinning, dancing, clapping, thinking, crawling, sleeping, hugging, nodding, hopping, batting, waving, catching, writing, skating, reading, winking, eating, singing, kicking, tip-toeing, swimming, stomping, laughing and riding. Your students will have great fun acting the different action verbs. They will ask to play and act out these cards again and again. This is a useful set of cards for children who are learning to use vocabulary related to feelings and emotions. 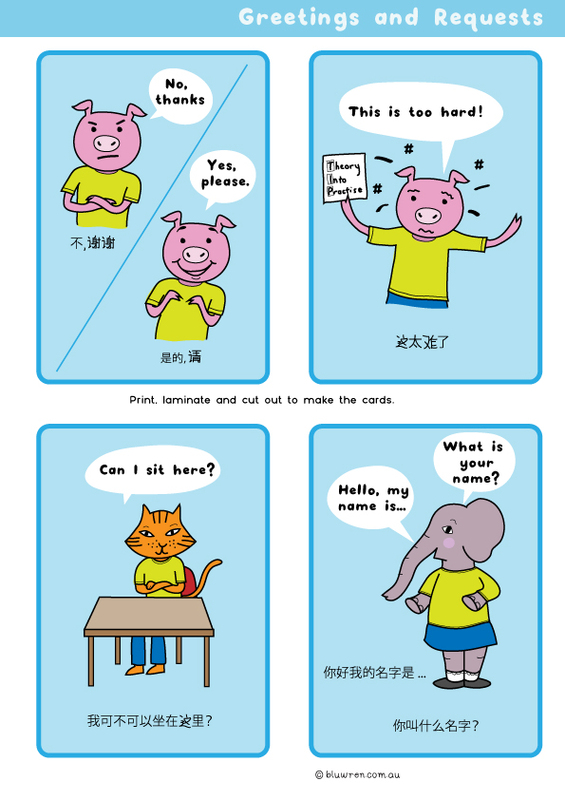 Engage your ESL/EAL students and students with special needs with these cards. The information contained on the cards teaches about whether the Australian animals have fur, feathers or scales, where they live and what they eat. The game is designed to be played as a quiz and aimed at primary-aged children or those learning English. Today I am featuring a newish product, that I have recently added to my TPT shop. I made this because my student always get confused with there, their and they’re and also when to use too. Simply print, laminate and cut out these cards and place them around the room and print the recording sheet for your students to use. They can complete the activity individually, in pairs or in small groups. If you’re quick it is on sale today and tomorrow at BLUWREN. 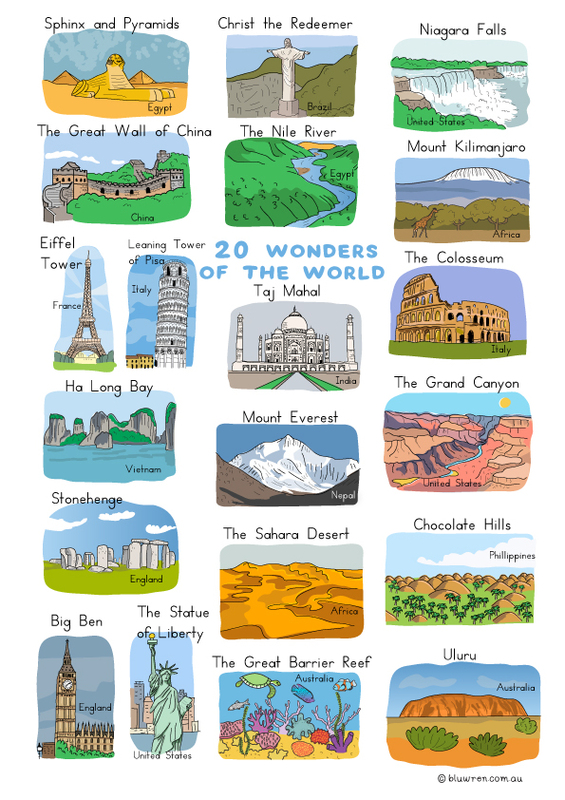 For ages now I have wanted to do some work on ‘The Wonders of the World’. So finally near the end of a busy year I have managed to create some cards and worksheets on this topic. Still in the development and trial stages, we will see what my students think of the work this week (I learned a thing or two preparing). Here is a little preview of what we may be covering. Loved doing the artwork for this one! I have created new worksheets and some new cards to my Feelings and Emotions set. There are now 30 different cards!!! I will upload the new file soon, so if you have purchased this set you can download it again to see and use the new worksheets and cards. These new ones were a little tricky, but fun. The feelings and emotions cards are very useful in encouraging your students to talk about how they feel. I used them this week in my classes for vocabulary, classifying and writing. But most importantly I used the picture cards to encourage the children to talk. Here are a few quotes taken from my Year 1 students during a lesson today – ‘calm means looking at a rainbow’, and ‘the fox at the farm makes me sad’. Don’t forget to drop by my TPT store BLUWREN. 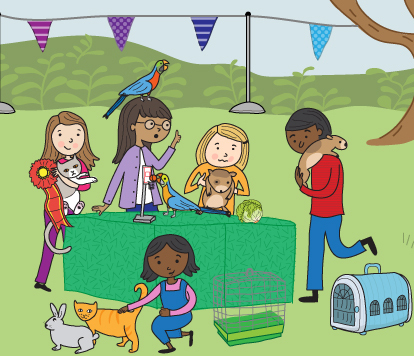 Many of my illustrations of late have featured kids outdoors or getting active. A good thing too. My page on ILLUSTRATORSAUSTRALIA is now updated. Please check out my new work. I am very pleased with the finished work for SWIMMING AUSTRALIA (you can not see it yet but will keep you informed). Just finishing off some Fairy Tale work. I have created a pack for bluwren based on four popular Fairy Tales – Little Red Riding Hood, The Three Little Pigs, Goldilocks and the Three Bears and Jack and the Beanstalk. In the pack there are 20 ‘Who am I ?’ cards and follow up reading and writing worksheets. The set is aimed at Foundation to Year 2 students. It is always so much fun working on these. 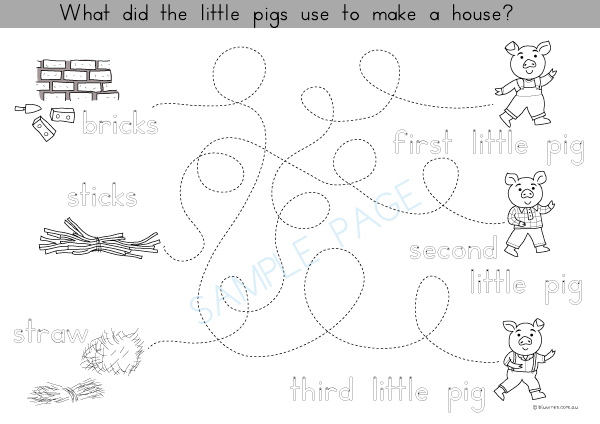 Here’s some samples of the worksheets for the Foundation, Year 1 and Year 2 students. It should be up in my shop in the next day or two. A new illustration for some education work.